I received this Starbucks advertising card from a friend today. 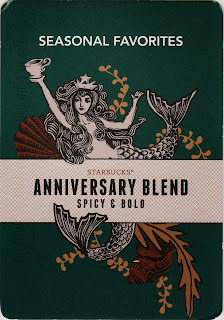 The card shows a colorful new look for the Starbucks Anniversary Blend: Spicy & Bold. What unique about this blend is that it contains aged coffee beans from Indonesia. According to their online store, "Long, long ago, coffee traveling from Indonesia to Europe was exposed to fluctuating temperatures in the wooden hulls of sailing ships. The unroasted beans took on intriguing flavors, much like the rare Aged Sumatra in this blend. Carefully aged for three to five years, these beans' cedary spice notes and full body combine beautifully with other Asia / Pacific coffees - a celebration of the passage of time." The first Starbucks store operated at 2000 Western Avenue in Seattle from 1971–1976. This store was later moved to 1912 Pike Place Market. I visited the Pike Place Market location around this time in 2010 during my Seattle stop of the JetBlue AYCJ trip. The store had retained its original feel through the hardwoods, furniture, lighting and store front. You can read more about the Starbucks® Anniversary Blend online. StarbucksMelody blog also had a post Anniversary Blend 2013: A Colorful New Look!